Training and Support: Kwik Kopy is a flexible franchise model. Kwik Kopy provides extensive training on every aspect of Centre operation. Initial training consists of up to four weeks in Sydney and at least one week on-site prior to opening. All store systems and procedures are fully documented in a set of proprietary manuals. Additional training for Owners and employees is provided via an ongoing training calendar, during biannual conventions, regular regional meetings and via specifically produced audio, video and print materials. GENERAL SUPPORT: As a Kwik Kopy Franchise Owner you have access to a dedicated Area Sales Manager (ASM) who provides one-on-one local support to you on every aspect of your business. The ASM team’s primary focus is to help franchisees increase sales and profitability. In the early days of your new business they will work with you side by side, to make certain that you are up and running as quickly and as successfully as possible. They then continue working with you to build your business. As well as the specialist support available from the ASM team, Kwik Kopy Australia produces an annual financial benchmark profile, against which individual Centres may compare their progress. Areas of opportunity can be readily identified and Kwik Kopy works with Centres to improve their performance accordingly. EXCLUSIVE TO KWIK KOPY IS PRINT SPEAK:Print Speak lets your data talk to you to grow your sales, work smarter, and outperform your competitors. Managing print production is a never-ending job, as is growing your business. Print Speak helps you get organised and win more sales, with 24/7 access to data, tools and business intelligence that will make life that much easier. Print Speak uses real time data, proven best practice methodologies, templates, and processes that help to ensure your business enjoys constant, steady growth. Better business means getting the little things right – the one-percenters. Print Speak gives you all you need to make that happen one step at a time, however and whenever you’re ready. This includes actual sales to budget information to tell you how you’re tracking at all times as well as a sales forecasting tool that predicts your likely sales results each month. IT SUPPORT & SYSTEMS: We use a sophisticated MIS (Management Information System) to operate the day to day business in a Kwik Kopy Centre. Our IT systems include a state of the art e-commerce solution (Zenith Web2Print) offering your customers the opportunity to work with you completely online. To answer questions or to help solve any technological issues, our trained IT professionals on the Kwik Kopy Help Desk are at your service during business hours.HUMAN RESOURCES:Our Human Resources department can help you recruit and develop staff, to assist you to become OHS compliant and run training and development courses. Besides our support team, Kwik Kopy has also developed a comprehensive intranet site called ‘InSite’, which is available 24 hours a day, seven days a week, offering technical advice, marketing and sales tips, franchise group news and many other helpful items. Marketing Support: Continuous marketing is carried out to further develop Kwik Kopy brand awareness and drive sales. Each financial year Kwik Kopy provides franchisees with an Annual Marketing Strategy Plan, documenting marketing activities for the forthcoming year. The ‘Marketing Portal’ allows you to manage all your marketing activity online. From the interactive marketing calendar which allows you to combine your own local marketing activity with the scheduled national campaigns to the online ordering of all marketing activity, you have a ‘one stop hub’ to maximise the efficiency of your marketing and help drive sales for your business. NATIONAL MARKETING:Brand marketing focuses on creating awareness of Kwik Kopy nationally and may use various media such as direct marketing, outdoor and web. Kwik Kopy also has a modern and effective website which provides a welcoming entry point for clients, generates interest and drives sales to Kwik Kopy Centres. A national PR strategy also helps to promote the brand nationwide. LOCAL MARKETING:Local marketing is used to help build awareness and sales in your specific marketing territory. All local marketing activities and options are also documented in the yearly Strategy Plan and you select the campaigns you wish to participate in. KWIK KOPY– Franchises for Sale – BUSINESS SERVICE FRANCHISES. Find all the latest franchises for sale all around Australia at Inside Franchise Business. Start your franchising journey with Kwik Kopy, the leading provider of print graphic design, printing and marketing services throughout Australia. 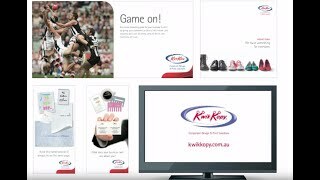 As a Kwik Kopy Franchise Owner you could be delivering a wide range of print and online solutions including business cards, brochures, catalogues, training materials, graphic design services, marketing plans, websites, email newsletter and direct marketing campaigns. Kwik Kopy is a flexible franchise model, where each Centre is fully equipped to create high quality graphic design and digital printing on-site. A B2B franchise means you generally work business hours (Monday – Friday) without the need to work on weekends, which is important for maintaining a good work/life balance. Our perfect Franchise Prospect is somebody who is young at heart, who has business experience with an entrepreneurial flair and most of all an absolute passion for customer service. Before starting in your Kwik Kopy franchise you will undergo all the training you require – so you do not need prior print or design experience to open your Kwik Kopy Centre. We have both existing and new locations for sale throughout Australia. Want to join a franchise with a proven track record? Want to work for yourself, but not by yourself?